A youth works at a makeshift oil refinery in Syria that, according to its owner, gets crude oil from Islamic State-controlled areas of Syria and Iraq. 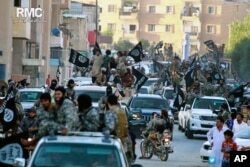 The United Nations Security Council is expected to adopt new measures Thursday to stem the flow of cash to terrorists of the self-proclaimed Islamic State (IS). For the first time, finance ministers of the 15-nation council will meet to adopt a resolution. The text is aimed at expanding and strengthening the current sanctions framework in place against al-Qaida to focus on the Islamic State group. “This resolution – if it passes, which we believe it will – will be a new piece of international law,” U.S. 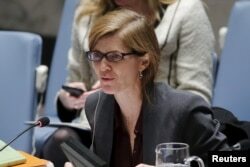 Ambassador Samantha Power, the council president, told reporters on Wednesday. She said the draft resolution would require countries to increase their efforts to choke off funding to the terrorist group, which has seized large areas of Syria and Iraq and is looking to expand its stronghold in Libya. U.S. Ambassador to the United Nations and current Security Council President Samantha Power speaks to members of the Security Council at the United Nations Headquarters in New York, Dec. 16, 2015. “Because while we have made progress and made big dents in ISIL’s ability to access funds – the fact that they are still able to traffic in cultural artifacts, in oil with smugglers, they are also extorting people who live in the territories that they occupy – this is a problem that we should be able to solve,” Power said, referring to the group by one of its acronyms. It is also known as ISIS and Da’esh. IS has been on the council's al-Qaida sanctions list since 2004 under “Al-Qaida in Iraq,” but the renaming of the sanctions regime to specifically include IS shows the council’s focus on the terror group. “And if we can get at ISIL’s wallet and its financial coffers in an intensified and even more aggressive way, that is going to have a material effect on their ability to prosecute war,” Power added. The unusually long and technical – nearly 30-page – text focuses on provisions to keep IS from accessing and using the international financial system to move cash. It also criminalizes a broader range of financial transactions to tie the hands of terrorists, and it strengthens monitoring of sanction violations. In addition, the resolution urges states to say what they are doing to keep money out of the terrorists’ hands. FILE - Fighters from the Islamic State group parade in Raqqa, north Syria, June 30, 2014. Former British spy chief says militants more than doubled the recruitment of foreign fighters to as much as 31,000 over the past 18 months. The presence of finance ministers, instead of the usual foreign ministers and ambassadors, at Thursday’s meeting is also a sign of the increasingly highly technical and specialized work involved in countering terrorism. The United States and Russia, which are often on opposing sides of issues in the Security Council, came together to co-draft the proposed text. "We support the initiative of the United States about the U.N. resolution," said Russian President Vladimir Putin at a news conference in Moscow Thursday. The cooperation on the resolution is the latest stage in Russian-American rapprochement over Syria, according to Columbia University professor Richard Gowan. “The Russians have pushed the Security Council to strengthen sanctions against ISIS all year, and it has won brownie points from the West for doing so,” Columbia University professor Richard Gowan said. Gowan added that cooperation on the resolution is the latest stage in the Russian-American rapprochement over Syria. That cooperation will also be on display Friday in New York, when foreign ministers from the 19 countries making up the International Support Group on Syria gather for talks on ending the nearly five-year-old civil war.